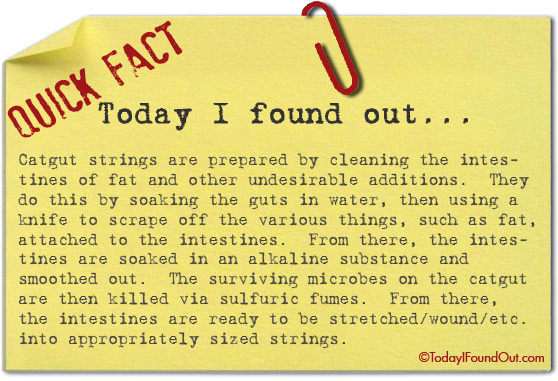 Catgut strings are prepared by cleaning the intestines of fat and other undesirable additions. They do this by soaking the guts in water, then using a knife to scrape off the various things, such as fat, attached to the intestines. From there, the intestines are soaked in an alkaline substance and smoothed out. The surviving microbes on the catgut are then killed via sulfuric fumes. From there, the intestines are ready to be stretched/wound/etc. into appropriately sized strings. There is no such thing as catgut strings. They are made from sheep gut – the catgut myth is just a story started by the early string makers to throw off competitors. Gut strings, correct term, are unusual these days except on Baroque style string instruments. Gut strings have a very short shelf life. Most strings are nylon or steel.